Last night, I attended my first children's literature writing critique group meeting. In my absence, my wife was excited to have the opportunity to read books at bedtime with our two oldest children. 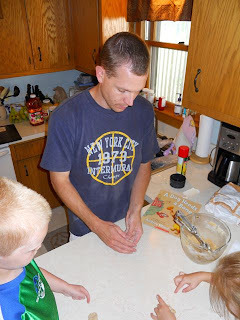 After I returned home, and we had a chance to talk about our evenings, I realized that my wife and I had similar experiences. At the meeting, I jumped at the chance to read my own picture book manuscript that I have worked on since last fall to a group of talented writers. At home, my wife was thrilled that my children chose to read a few books by Audrey Wood, which were perfect for celebrating her birthday. At the meeting, after reading my manuscript, I learned that every word in a picture book must be just right -- in my manuscript's case -- to achieve perfect meter and rhyme. 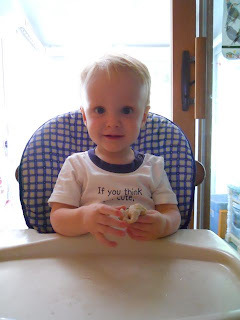 At home, my wife learned after reading Piggie Pie Po that when an author achieves that perfection -- every word carefully selected -- the book is a joy to read aloud. Audrey Wood is the author of over 30 books and many of these books have been illustrated by herself or her husband, Don Wood. Together they collaborated on the 1986 Caldecott Honor book King Bidgood's in the Bathtub, which my son described as "a silly book." Many of Audrey Wood's books have been favorites in our house since my two oldest children were toddlers including Piggies and Ten Little Fish. 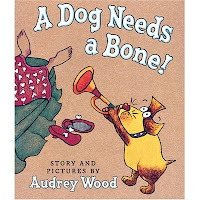 Our birthday celebration for Audrey Wood began by reading, A Dog Needs a Bone!, one night before bedtime. Audrey Wood was inspired to make this book by "a series of doodles she drew while on the phone" and quite possibly "one of her two pugs whispered the story idea in her ear while she was napping." (Audreywood.com). The illustration process caused her some "frustration" while experimenting with different mediums. However, she solved her problem of which medium to use when she recalled "spending entire rainy days creating art on paper bags with crayon." 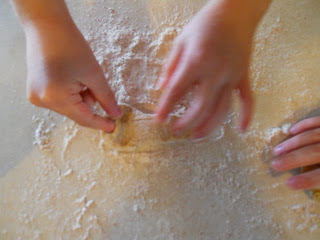 My daughter read the recipe and helped her brother mix all the ingredients into a soft dough. Our first thought was use our dog-bone-cookie-cutter, but we couldn't find it. 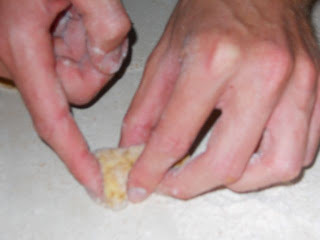 We improvised by shaping a teaspoonful of dough with our fingers. 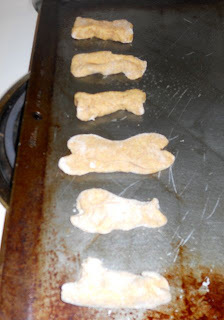 I was surprised that even our first few attempts at least resembled the shape of a dog bone. 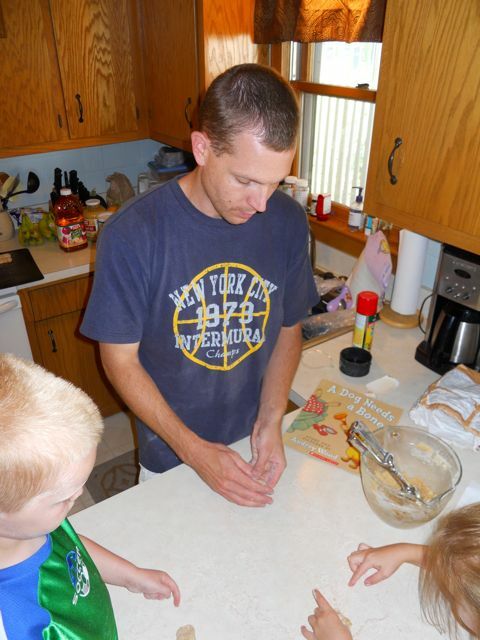 The littlest one even wanted to help out on this project. We found that a well-floured surface worked very well. Now that we are experience doggie biscuit makers we can share that squeezing the middle while flattening the end was the best strategy for making a perfect bone-shaped treat. 20-25 minutes in the oven at 350 degrees! 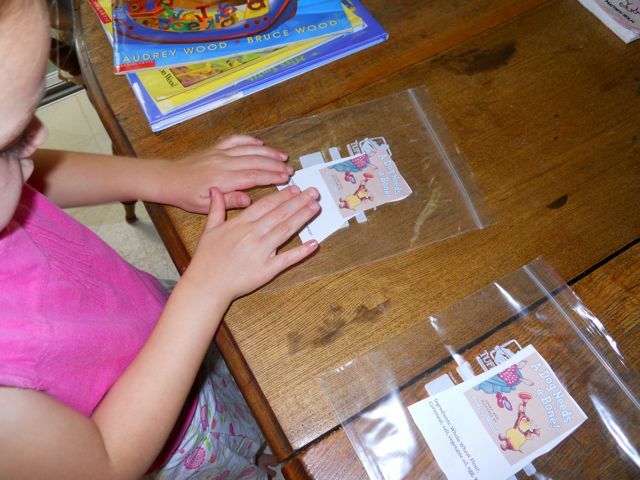 My daughter made labels and taped them to baggies. 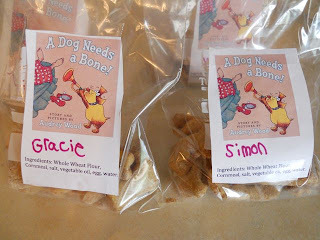 The doggie biscuits were ready for delivery to our favorite friends! 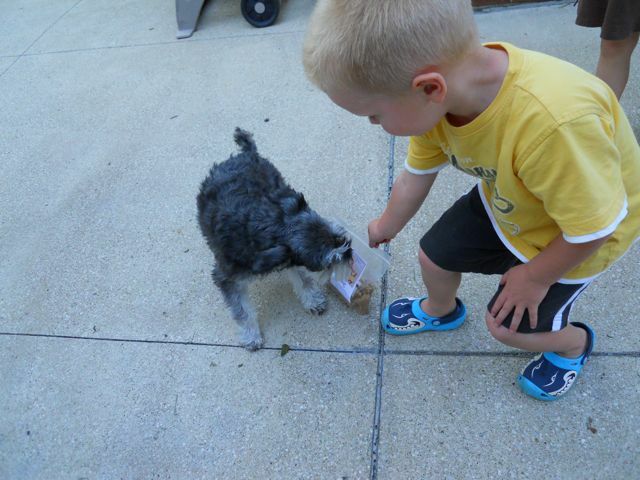 Our next door neighbor, Gracie was excited to see the kids and the treats! Yum! She was definitely in need of a bone and she gobbled it right up! I have mentioned many times before that my daughter has come to expect well-planned activities to celebrate the birthdays of authors. She will not hesitate to offer suggestions on what a good activity would be. This week, my son loved reading the Alphabet Adventure books that Audrey Wood created with her son Bruce Wood. (Alphabet Adventure, Alphabet Mystery - which was inspired in part by a birthday card from her son, and Alphabet Rescue). The initial idea for the books was inspired by two preschool children, one who thought traditional alphabet books were boring and for one who was shocked to learn at school that in addition to the capital letters there were also lowercase letters. (Audreywood.com). In each of the books a set of lowercase letters work together to solve a problem (which is definitely not boring) that begins to be solved on a full page spread illustration where each letter finds a item that starts with their letter (resembles a traditional alphabet book but with lowercase letters). Before reading the last book in the series tonight my son said, "Dad, an activity we can do is take all the letter cookie cutters we have to the basement and set them on the floor." I was so excited to hear that he was thinking of a way to bring his favorite books from this week to life! I was born on August the 12th a date when a spectacular, celestial fireworks show occurs every year. To enjoy the show I need only look up at the night sky around 2:00 am in the morning. Every year on my birthday the meteor Showers of Perseid shoot across our skies. I like to make a wish on the first shooting star I see, then count how many I can spot over an hours period. Lastly, while I was looking through all the great activities and stories behind many of her books on her website I found a story she shares about a birthday party she planned with Don for their son Bruce when he was six years old. Audrey mentions that this birthday party experience influenced her book, The Flying Dragon Room. Click Here to read the story and then stay a while on this wonderful website! Fun post, Eric! The kids have been asking me to make dog biscuits with them. We'll have to take a trip to the library this weekend. Hopefully, our biscuits will turn out as cute as yours! It was great to meet you last night; I hope you come back next month! Colleen, Thanks so much. I would love to come back to the group. 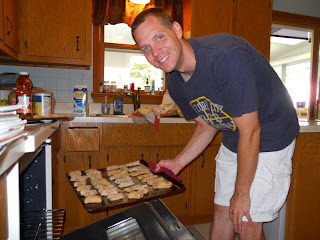 Let me know how your biscuits turn out! Enjoyed the post (as always). 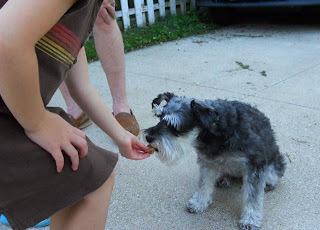 Gracie LOVED the dog biscuits you all made for her. Thanks for thinking of her! Love the idea of birthdays of authors!!! Thanks for joining my Planet Weidknecht Weekend Hop! I'll have to try those dog biscuits! Thanks for sharing. And about the critique group-yes, those groups can be really enlightening. I love the one I belong to. I have learned so much! 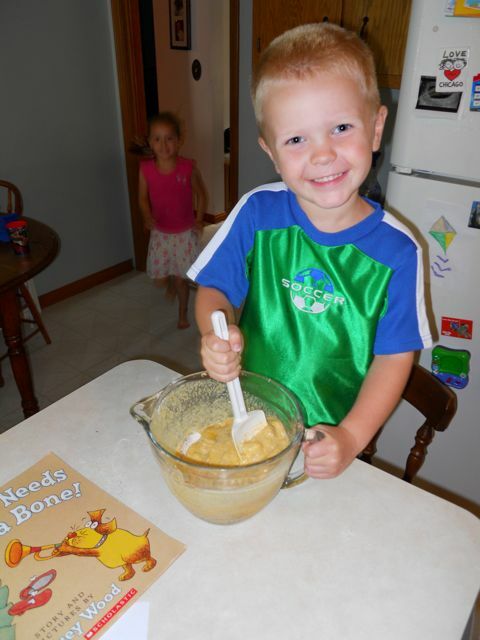 We are quite fond of her books, especially The Napping House and The Big, Hungry Bear! Happy belated birthday to Mrs. Wood! Thank you everyone for all the comments. I appreciate them very much.